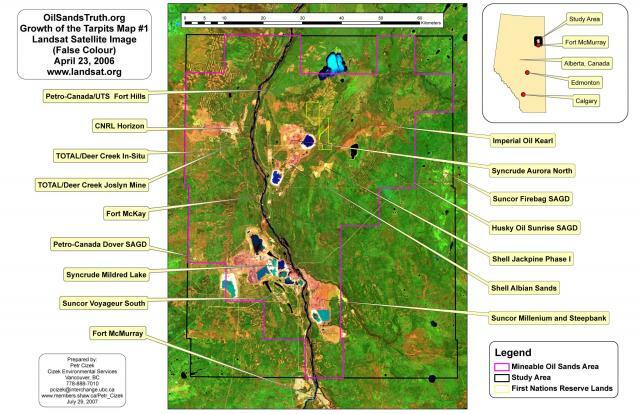 Map #1 shows a Landsat satellite image from April 23, 2006 with the "Mineable Oil Sands" boundary outlined in purple and the study area within which the physical footprint was calculated outlined in black. The green areas show undisturbed forest and other plants. The current open pit mines and industrial facilities of the tarpits can be seen in the beige and light brown solid areas where the topsoil has been scraped away and all the natural tree, plant, or water cover has been removed. The tailings ponds can be seen as the blue areas all surrounded by the whitish bands, which are gravel and cement retaining dams. The new subdivisions on the edge of Fort McMurray in the south and bottom of the map are also light beige. The Athabasca River can be seen flowing northward as a dark blue band between the tarpits and along the First Nation village of Fort McKay. Some other areas disturbed by logging or forest fires also appear beige or light brown. The logging areas are square patches while the forest fires are irregular shapes with patches of green where live trees are still standing or regrowing.